This healthy snack is a great way to approach the subject of Remembrance Day with your kids. 1. Grab your stalk of celery and your knife and slice about 15 thin slices off your celery stalk. Place these thin pieces on a plate to cover the ground. 2. With the remaining celery, slice very thin slices that will become the poppy stems. Place these on your plate. 3. 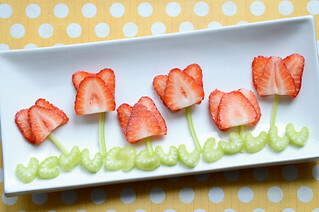 Take your strawberries and using your knife, slice the strawberries into thin slices. Arrange these thin slices into poppy shapes on your plate. I used 3 strawberry slices per flower. This snack is a great way to approach the subject of Remembrance Day with your kids and it’s really easy to make! Enjoy! I’m usually a fan of fun snacks to mark special occasions, but in the case it seems very inappropriate to take the poppy, a symbol of such horror and sacrifice, and turn it into a cutesy snack to eat. I think perhaps there are other ways introduce kids to the symbol and the significance of the day that better maintain it’s dignity and solemnity. I think that it’s a great way to reiterate everything that they learn about this day. Cute snack, Jill. I come from an army family, I support the Canadian Legion and attend Remembrance Day ceremonies annually. I think this is a huge topic that is sometimes overwhelming for adults to comprehend. I think this is a lovely way to bring this up with children. Remembering and teaching in gentle ways can lead into a lifetime of respect and wonder.